Here is a folk-pop duet. Here is a rock song. Here is a man on a rubab. Here is a singer performing in a traditional style. 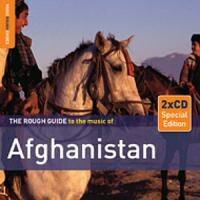 This is not the first time that the compiler of this album, Simon Broughton, who also assembled the Rough Guide to Central Asia in 2005, has tried to bring Afghan music to the attention of an English-speaking audience. He is the editor of the UK music magazine Songlines, which has run articles on the rubab, and on musicians in Kabul, and in 2002 he directed a documentary, Breaking the Silence, which examined the return of instruments to the country's capital after years of the Taliban rulers kicking the necks off the ghijaks and forbidding anything musical on the radio besides unaccompanied vocal chant. A sarinda player nicknamed Mashinai, "because of his ability to pick up tunes like a machine", appears in the documentary, chopping raw meat on a block with a small axe. "They stopped the music and destroyed my instruments," he says through a translator. "I needed another job so I had to become a butcher. I've been working here for five years." Chunk goes the axe. There is a shot of ribs being hung on hooks. He appears on the Rough Guide to Afghanistan, sarinda restored, slithery and tart on this violin-like instrument, working his way through a series of Logari folk tunes, putting miles between himself and the cruel chunk. The tabla percussion that accompanies him is a background presence that runs through much of the album, setting the pace, even on the opening pop song, a mix of singing and synthesiser from Setara Hussainzada, who was once a contestant on the TV show Afghan Star. She was voted off before she could win, but there was a ruckus when her veil slipped in front of the camera, showing her hair. The song she covers is a popular one, "Zim Zim Zim", composed by the musician and poet Nainaz Fazel Ahmad Zekrya, who doesn't appear here in person, but who could serve as the focus for a minor six-degrees-of-separation game. He was a mentor to Ahmad Zahir, "the Afghan Elvis," whose "Leili-Jan", recorded in the late 1970s, is a romantic three and a half minutes with a horn hook, and it's not hard to find online footage of "Zim Zim Zim" being performed by Farida Mahwash, whose singing is so admired by her compiler that he gives her two songs instead of one, "Gar Konad Saheb-E-Man" and "Mola Mamad Djan". Hussainzada's breathless performance comes to an end, and there is a pause between the tracks, and then Mahwash's voice like a viola streams in. Listeners who like the more internationally famous sounds of India or Sufi Pakistan might feel their ears prick up -- wait! The drone! That glide of the ah! The musical boundaries in this part of the world are porous, the listener decides. The Indian sarod was once the Afghan rubab, and then there is that tabla, and also the Sufi hum. The final track on the album is a qawwal, "Rae Maykhana O Masjid", earthy singing, even rough, accompanied by flute and drugged harmonium. Humayun Sakhi's rolling "Kataghani" is, notes Broughton, "a variation on an Uzbek-style tune from northern Afghanistan". But I loved, most of all, Saftun Tawakuli's "Dobaiti Hazaragi" a Hazara song performed live on woody-sounding dambura. The character of the playing and the timbre of the instrument reminded me of A. Dzhumabaev's "Ak Manday", a song that has been one of my favourites for at least ten years, or since I found it on Yazoo's Secret Music of Mankind: Central Asia 1925-48. Dzhumabaev came from Kyrgyzstan. Broughton pursues the same aesthetic that guided his Rough Guide to Central Asia, choosing the songs so that different aspects of the country are displayed. Here is a folk-pop duet. Here is a rock song. Here is a man on a rubab. Here is a singer performing in a traditional style. Here is a musician from Kabul. Here is a diaspora musician. Here is someone from the north. This approach means that the listener is probably not going to hear the 15 best songs the country has to offer -- it's difficult to imagine that this vivid but lightly-sung "Zim Zim Zim" was better than every Afghan song in the world bar the 14 that share the album with it -- but it gives you the opportunity to listen to the country through a kind of panopticon, ears out in 15 different directions.